Thought Peek: Alaska IronKids Philippines Triathlon encourages more and more Filipino children into adopting an active and healthy lifestyle. Alaska IronKids Philippines Triathlon encourages more and more Filipino children into adopting an active and healthy lifestyle. These days, the only exercise children seem to be doing is surfing, the digital kind that is. Instead of playing outside with their friends, today’s children stay indoors, glued to the TV or to videogames. It isno wonder then that 2 out of 10 Filipino children, 10 years old and below, are overweight while 3 of 10 children are undernourished as seen in the results of the 7th National Nutrition Survey conducted by the Department of Science and Technology-Food and Nutrition Research Institute (DOST-FNRI). But the inactive landscape is slowly changing in recent years, thanks to pioneering sports programs like the Alaska IronKids Philippines Triathlon, which has managed to convert a number of kids from couch potatoes to young triathletes who have the passion for the sport. A triathlon is a race that is comprised of three sporting events: swimming, running and biking. It is open to children 6 to 14 years old. Alaska IronKids Philippines is the country’s very first triathlon event for the youth.Since holding its first race in 2012, the local triathlon series has grown in leaps and bounds, grooming young triathletes that have become the pride of the Philippines in international competitions. Being the local junior version of the international triathlon series, Ironman, Alaska IronKids Philippines Triathlon has produced champions, on and out of the podiums— children who are not only committed to winning but also ones who understand that losing is also winning, having learned the values of determination, hard work, teamwork, discipline and sportsmanship from their experiences in the race. This Sunday (April 13, 2014), Alaska IronKids Philippines will be holding its first triathlon of the year at La Stanza in Marikina. This is the second in the Alaska IronKids Philippines series of races for 2014, which kicked-off with an aquathlon race last February at BF Homes, Parañaque.This year, Alaska IronKidsPhilippines will be starting a non-competitive, no-age category, dividing each race into three parts: Race; Play, which is non-competitive and has no age categories; and Relay, which is composed of two mix age groups. The Play category was added to encourage more children to try out the sport and just join the races for the fun of it, without the burden of competition and the pressure of winning. There will be another aquathlon race in May at Club Manila East and a triathlon in August in Cebu. In October, Alaska Milk will be holding the Alaska IronKids Philippines Family Triathlon, the very first family-oriented triathlon event in the country. It aims to encourage families to adopt a healthy and active lifestyle as well as serve as an avenue for parents and kids to bond and build lasting relationship. 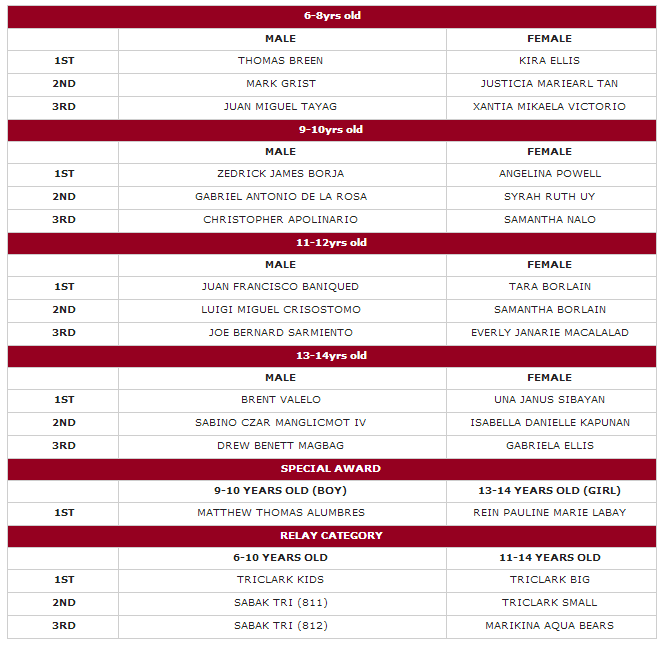 For more information, check out the Alaska IronKids website, www.ironkidsphil.com and www.alaskamilk.com.ph. How was the Alaska Cycle Philippines 2014?